Last week Nemo blew through town. Except he leaned left and buried Boston. We lucked out with only seven inches. Whew! I don't know what I would have done with two feet! 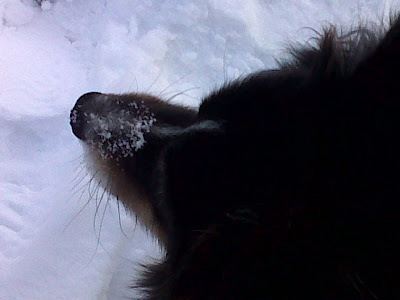 My Sadie, however, LOVES snow. Loves it! 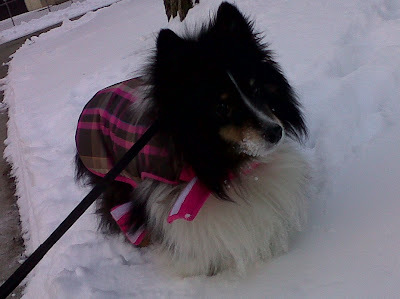 She is just the most adorable little being on the planet when she walks in fresh snow. She loves to run in it and jump in it (sometimes so deep that I have to lift her out) and her absolute favorite thing to do is eat it. She's so weird and wonderful and just melts my heart with her pure delight! This year, we added a coat to our super cold day routine. I am not a dress up your dog sort of person. However, Sadie is 10 and we have some really cold days around here. 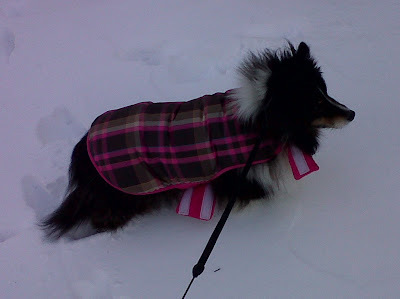 I bought the coat on a whim, hoping she would tolerate it. The results...she LOVES it. If I hold it up, she comes running and wagging her tail. She would wear it inside if I left it on her. Ah-dor-able. As you can see, the straps are too long and I need to cut them. But we make it work until I get around it that little task. Oh how I just love this little fur baby with my whole heart! She's a cutie! The coat is adorable too, I would have bought it if it had been me. 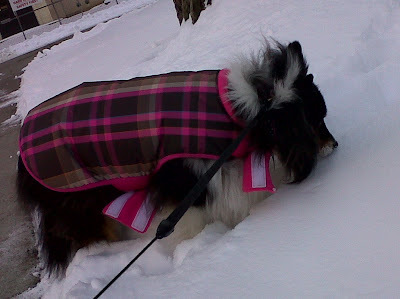 My Laney loves the snow too, she just doesn't like the cold. All of our snow melted today and the birds have started singing, hopefully spring is just around the corner. Awww Sadie is adorable in her preptastic coat! My sheltie was totally a clothing tortured as a puppy: tuxedo, winnie the pooh toddler dress, he suffered it all. 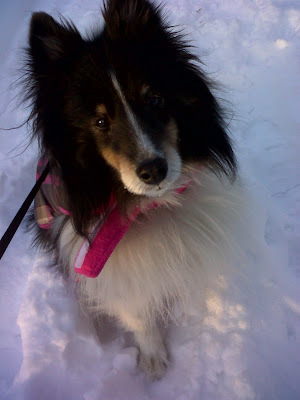 I totally concur Sadie needs to be Sheltie Nation'd, still waiting for my picture to be posted there!